ADZJUNCTION Email advertising network details. 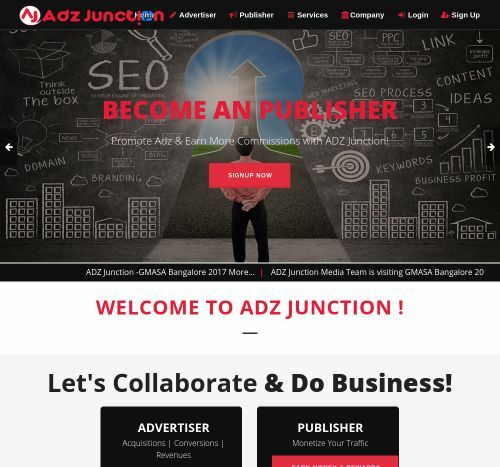 ADZ Junction Media is one of the fastest growing Ad Network in INDIA. Since the first day, we are helping Advertisers to reach their Target Audience & help them to achieve good ROI with the help of our expert advice. Simultaneously we help our Partners to choose from the variety of Top & Best converting offers with the best payouts in the Market/Industry. We providing services like:- Lead Generation (CPL), Surveys, Emails (Cost per Mail Sent-CPM), Pure Branding (CPM), Roadblocks, Mobile Acquisition (CPI, CPR, CPAT), Mobile Branding (mCPC), Web Acquisition (CPT/CPA), Value Added Services (VAS) & Videos. You can check ADZJUNCTION reviews on Affbank and ask ADZJUNCTION Team any question by using the contacts above, especially about how to earn money!